Actually stayed July 2017. Accidentally found place to miss a storm while heading from Little Bighorn Battlefield to Cody, Wyoming. Loved the place and Gary the owner was awesome. Ended up staying two nights so that we could travel to nearby Red Lodge, Montana and travel over Beartooth Pass. Ranch is beautiful and Gary has done an amazing job designing and building the lodge himself. Contacted BearTrap Ranch on 6/15/18 and spoke with a gentleman named Gary. My inquiry was about on-site accommodations with specific interest in the cabin with a bathroom and the tipis. 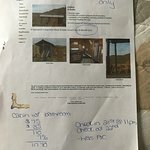 Upon discovering that the tipis did not have AC nor a bathroom, I informed Gary that the tipis would not be a suitable option for our family as my husband is a disabled veteran and we have two young children so an AC and bathroom are sought after and necessary accommodations. Gary was more than happy to offer the accommodations our family required and we reviewed the pricing for the cabin with a bathroom. Upon requesting a reservation confirmation, I was informed that a reservation was not required, so I printed a copy of the cabin details included the discussed pricing breakdown (see attachment 1). To reduce confusion, I emailed BearTrap Ranch including the information specified during our conversation so that both the ranch and our family would have a record (see attachment 2). On 7/21/18 I phone BearTrap Ranch to convey that our anticipated arrival as an hour earlier where a gentleman informed that we would be staying in the BearTrap Ranch tipis. I told the gentleman that this is not what was agreed upon a month earlier and the gentleman said “I’m sorry young lady that’s all I got”. At that point I told the gentleman we would not be staying at their establishment and hung up. A few moments after ending our conversation a woman phoned us to better understand what occurred. This gesture was overshadowed by a gentleman yelling in the background leading to my husband’s use of choice words and concluding the conversation. Poor planning and documentation on BearTrap Ranch’s account left our family searching for lodging at 10:00 pm. This proved to be very difficult as lodging in the surrounding cities were sold out due to an Iron Horse Motorcycle event taking place that weekend. We traveled 7 hours to reach the Ranch’s location, so to say we were upset is an understatement. We had plans the following morning to meet with family in Billings, MT however, having to locate accommodations elsewhere forced our family to cancel those plans. Back in Houston, Texas and missing this Montana Gem! The owner has an RV (which we rented and was very well kept), cabins and teepees for rent; he's built these himself. Bear Trap Ranch is truly a hidden gem and wish we could of stayed longer. During a last minute trip to Yellowstone NP I couldn't find an affordable place to stay for my family and I. This ranch came up in VRBO and it was above and beyond our expectations! I couldn't book via VRBO for a same day and late night arrival so I called the ranch directly and was good to go. They have a fully stocked pond with fishing poles available which I regret not having some time for my son and I to fish a bit. There's a breathtaking mountain view and easy river access. The owner and beautiful partner were amazingly warm, caring and helpful. They provided maps with day trip drives and things to do around MT/WY. Make sure to visit Big Horn Canyon!